Under Armour Vs. Nike: Which Athletic Stock is No. 1? When it comes to the sports apparel business, two companies are dominant players. The big gorilla is of course Nike (NYSE: NKE). And then there is the far younger and innovative Under Armour (NYSE: UA). Both stocks should benefit from the growth of health of the U.S. economy and the American consumer. But which stocks is the best bet for your investment portfolio in 2015? That’s a good question…and we’ll give you our answer. Athletic apparel maker Under Armour (NYSE: UA) turned in a great earnings report this week. Under Armour is ramping up its competition against industry leader Nike (NYSE: NKE), and UA stock has been on a torrid multi-year run. 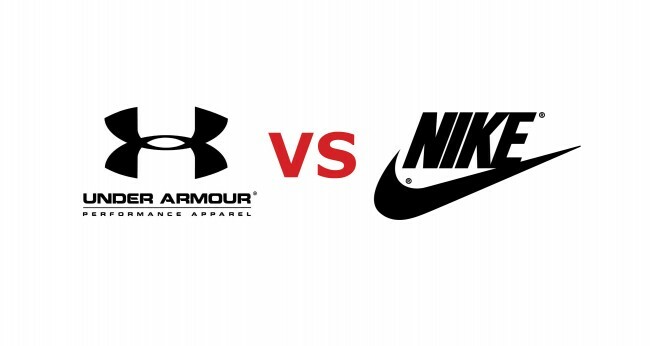 Investors want to know which stock, Under Armour or Nike, is the better buy? Under Armour’s fourth-quarter net income increased from $64 million to $88 million from last year’s quarter, a 37.5% gain. Diluted EPS was up from $0.30 to $0.40, a 33% gain. Fourth-quarter net revenue increased from $683 million to $895 million, a 31% increase. The quarter’s results were led by a 30% increase in apparel revenue to $708 million, as Under Armour continued to offer new products in its line. Footwear sales grew by 56% to $86 million, with expansion in running and basketball shoe sales. The company reported that fourth-quarter gross margins fell slightly to 49.9% from 51.3% in the year ago quarter, while expenses, which included marketing, were 33.6% of net revenue, compared to 36.9% in the year-earlier period. Full-year results were along similar lines as the fourth quarter’s. Diluted EPS was $0.95, a gain of 27% from the previous year, while net revenue grew 32% to $3.08 billion. Under Armour continues both its international initiatives and the growth of its footwear segment. It signed NBA star Stephen Curry, and already has Super Bowl hero Tom Brady in the fold. A new running shoe, the Speedform Gemini, will be unveiled soon. Plus, the apparel maker acquired Endomondo and MyFitnessPal to create a larger digital health and fitness community. The future looks bright for Under Armour. Next year, sales are expected to grow 22.6% and EPS could climb 29.7%. That’s impressive growth for a company with $4 billion in annual sales. Nike’s fundamentals are also strong. Nike hasn’t yet reported its earnings. It’s next financial report will be released in mid-March. When Nike released its fiscal second quarter financials in mid-December, the company reported a 15% increase in revenues. Meanwhile, earnings per share grew a healthy 25%. Estimates for Nike’s next quarter are for $0.86 EPS, up from $0.76 cents, with revenue projected to increase to $7.6 billion from $6.9 billion. Its full-year EPS is projected for $3.58 versus $2.97, with revenue at $30.9 billion compared to $27.8 billion. For the current fiscal year (ending May, 2015), analysts expect Nike to report EPS of $3.58. That would be a 20.5% increase from last year. Meanwhile, full year sales are expected to grow 11.1%. Shares of both Nike and Under Armour have been strong performers. In the last five years, Under Armour stock has risen an incredible 1,045%, from $6 a share to its current $72. Nike stock has risen from around $32 a share to $92, a 196% increase. The S&P 500 has climbed 90% in that time. Under Armour stock has a $15.5 billion market cap and sells at 75 times current earnings, while Nike stock has an $80 billion market cap and trades at 27 times earnings. Nike also pays a dividend that currently yields 1.21%, and it has repurchased $4.7 billion of its stock in a four-year buyback program. Under Armour is on an aggressive growth path, yet the scale of the two competitors may be telling. Nike does$14.5 billion in annual footwear sales. That gives the company 53% of the worldwide athletic footwear market. By comparison, Under Armour has just a 3% market share. Clearly, Under Armour is advancing rapidly. Despite signing Stephen Curry, Under Armour has bumped up against the legendary NBA strength of Nike. When Under Armour tried to sign Kevin Durant, Nike stepped in and upped the ante with a ten-year, $300 million deal for the superstar. Nike still has a tremendous pantheon of stars, including LeBron James as well as the legend Michael Jordan. It’s impressive that Jordan’s line still accounts for $2.5 billion in Nike sales. Meanwhile, Under Armour’s total footwear sales were around $300 million. Nike has a far larger global footprint than Under Armour. 60% of Nike’s business is outside of the U.S., versus just 10% for Under Armour. The global economic slowdown will hurt Nike a bit, as will currency exchange rates. But those same conditions will also make it harder for Under Armour to get the kind of quantum jump it wants in the overseas trade. Both companies benefit from the “athleisure” phenomenon, in which people wear athletic apparel beyond sports simply as everyday fashion. So Which Stock Should You Buy? Under Armour’s a terrific company, but it trades at about 51 times forward earnings. This means it will have to continue to deliver outsized results. Nike shares trade a a P/E multiple of 23. Nike doesn’t have the same 20% – 30% growth rate as Under Armour. But Nike does offer healthy and consistent growth that should reward long term investors. The bottom line is that Under Armour stock is priced to perfection. This means any slowdown or headwinds could have a big, negative impact on the stock. For this reason, Nike is the better stock to buy today. The healthy consistent growth, history of strong operating results, reasonable valuation, small dividend, and big stock buybacks make Nike stock attractive today. Nike stock won’t provide a wild ride for risk-seeking investors. But the stock should continue to beat the S&P 500 in a big way.